NES Financial interviewed 26 of the EB-5 industry’s leading experts and asked what they foresaw as the major challenges and opportunities facing the industry in 2015. The biggest driver toward global expansion today is retrogression for mainland China-born applicants. Retrogression became a reality for the first time in 2014, and its impact is not likely to fade anytime soon. As the waiting line for Chinese investors grows, it is no surprise that global expansion was cited as one of EB-5’s top priorities. Assuming that no change in legislation occurs that would allow for more visas overall, seeking investors from countries other than China may be the only opportunity available to expand the market. A second major driver of global expansion is competition. Since 2010 there has been explosive growth in the number of EB-5 regional centers approved by the United States Citizenship and Immigration Services (USCIS). In a time where traditional financing was not readily accessible, developers seeking alternative sources of capital flocked to these approved regional centers and even sought to get their own regional centers approved. As a result, the market became flooded with projects seeking investors. Given that China has the most advanced infrastructure for sourcing investors, it has traditionally been the obvious place for issuers to market their projects. However, it is also the market where competition for investors is the fiercest. To attract and secure investors, issuers need to retain the services of migration agents. Because there are a limited number of agents/brokers to work with, supply and demand forces are in full swing, driving the cost of sourcing capital this way higher and higher. As cost and competition for investors in China rise, the importance of developing networks in other countries becomes paramount. 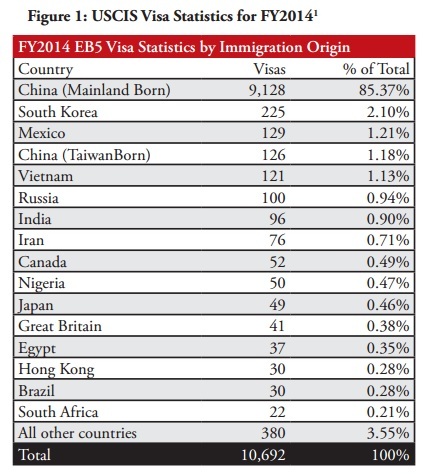 USCIS publishes EB-5 visa statistics quarterly but only breaks them down by country on an annual basis. 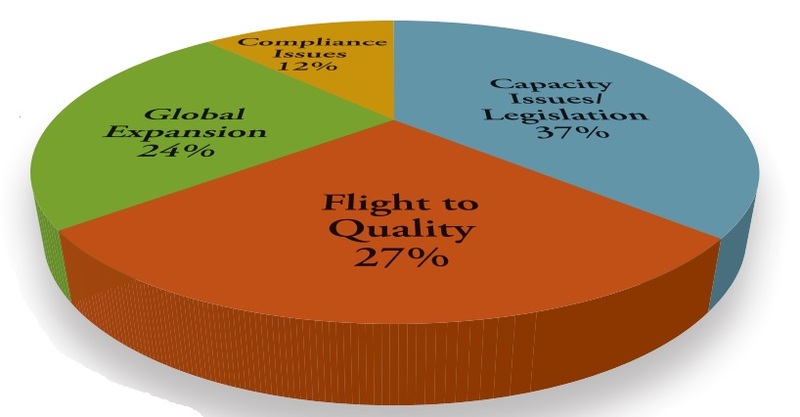 The most recently published statistics shown below in Figure 1 reflect FY2014 data. China is still by far the largest source of investors, representing over 85 percent of program participants. South Korea, Mexico, and Vietnam, while paling in comparison to China with a combined market share of less than 5 percent, make up the next largest markets. Until other markets develop more sophisticated EB-5 infrastructures, China will most definitely remain the dominant source for investors in the foreseeable future. Competition will remain extremely high in China, and without an increase in the number of visas available through this program the effects of retrogression will persist. Over the last 12-18 months we have seen a significant shift away from China. While mainly focused within the Persian Gulf, Eastern Europe, and Latin America, marketing efforts are being launched in countries all over the world. Because the federal government’s fiscal year ends Sept. 30th, the most recently published data actually represents petitions filed and approved between Oct. 1, 2013 and Sept. 30, 2014. Consequently, although it is too soon for the USCIS data to reflect these efforts, once the petitions for these new investors are filed, we will expect to see a very different result. A more accurate source to study trends in the global diversification of EB-5 investors would be to look at data associated with escrow. Since the majority of projects use escrow during the subscription process and the receipt of funds into escrow happens before the I-526 filing, this data is much more indicative of the current industry trends. 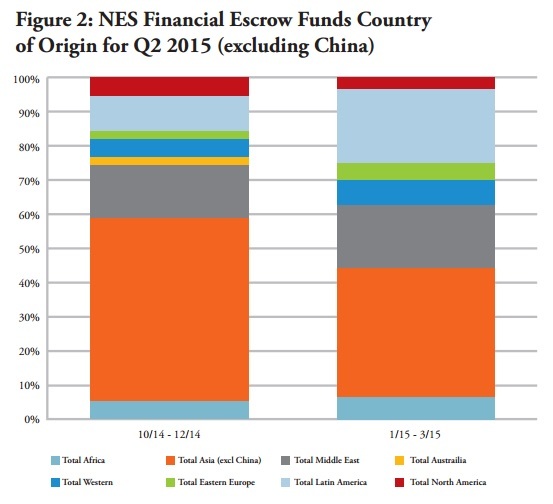 Comparing recent subscription escrow data from NES Financial’s experience in over 300 EB-5 projects (see Figure 2 below) against the country of origin data presented above shows some interesting shifts in country of origin. The chart above represents the percentage of overall escrow funding by market region (excluding China) over the last two calendar quarters. The other Asian markets represent the largest region for EB-5 activity. This is consistent with the USCIS data above that showed South Korea, Taiwan, and Vietnam as prominent markets. Comparing Q4 2014 to Q1 2015, a significant shift appears to be emerging with other markets starting to perform as top players. While the “Other Asia” market is still the largest at about 40 percent of total other funds, its dominance has waned since the prior quarter. The other markets taking ground are Eastern Europe, the Middle East, and Latin America. Within Eastern Europe, the largest contributing country continues to be Russia, but Ukraine has shown the most significant increase in activity. EB-5 activity in the Middle East is dominated by the United Arab Emirates, but there is also considerable interest coming from Iran. The region with the most significant change in just one quarter is Latin America. There are several countries driving growth out of this region. 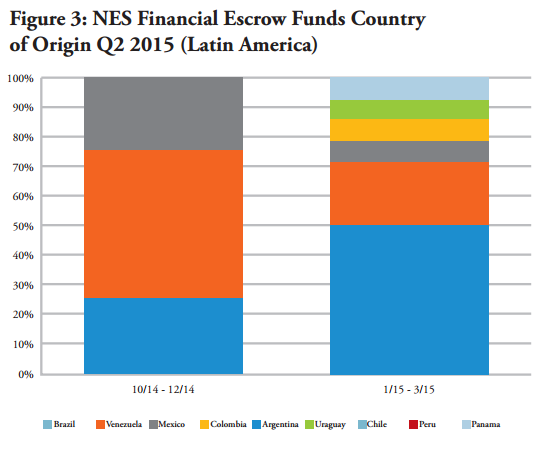 The following chart shows the quarter over quarter comparison by individual markets within Latin America. Over that last two quarters, there has been an increase in the number of countries within Latin America where investors are coming from. The charts also show a dramatic increase in investor flow from Brazil. So much so that it has emerged as the largest source for EB-5 investors within Latin America. While the number of non-Chinese investors is still comparatively very small, this is particularly interesting given that Brazil was the 14th country behind China on the USCIS list. Moreover, in the last quarter, the number of investors from Brazil was greater than Mexico and equivalent to the number of investors from South Korea, which has historically been the second largest market. This surge may be attributable to recent political and economic uncertainty in Brazil stemming from a massive scandal that involves allegations of kickbacks and corruption by the president’s political party. The scandal has also impacted the country’s largest construction companies and paralyzed infrastructure development. From an economic point of view, the currency is at its lowest point in over a decade. GDP is projected to contract, interest rates are high, and inflation is over 8 percent. It is not expected that growth in any of these other markets will impact the overall investor flow from China. However, it will be interesting to see if there are other factors that influence the industry as a result. For example, it is likely that differences in investor motivation from one region to another will impact the types of offerings that can be marketed successfully. This might mean that in order to meet the needs of investors, issuers will have to structure their offerings for the same project differently according to the market. If this emerges as a trend, it will be interesting to see whether terms in one market impact another. Only time will tell how all of this will play out. Reid Thomas serves as the executive vice president for NES Financial. Responsible for global sales and marketing, he brings over 20 years of experience from both private and public Silicon Valley technology companies. Thomas’s expertise includes escrow and fund administration. He is a frequent author and speaker in the EB-5 community.